After that, Give your feet a daily tea bath that calms, restores, and also eliminates offensive odors! Just boil three or four brewed tea bags in one quart of water for ten minutes. Once the water has cooled enough to be comfortable for your feet, soak them for twenty to thirty minutes. Rinse your hands with water and a brewed tea bag to remove food odors, especially onions and fish. Chrysanthemum tea is a warm, herbal beverage prepared from dried chrysanthemum flowers. This tea has a delicate, slightly floral aroma and a light, refreshing taste. Chrysanthemum tea has long been used in traditional Chinese medicine to treat various internal and external health issues. 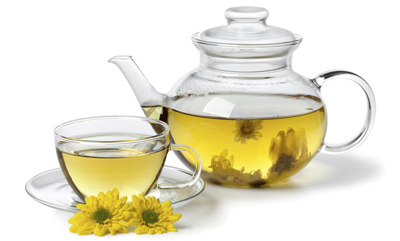 Chrysanthemums can cause side effects in some people, so consult your doctor before consuming chrysanthemum tea. Avoid any type of chrysanthemum supplements if you are allergic to ragweed. The Memorial Sloan-Kettering Cancer Center reports that chrysanthemum supplements increase coronary blood flow and reduce capillary permeability. According to the Herbs 2000 website, clinical trials performed in China and Japan indicated that chrysanthemum effectively reduced blood pressure levels and relieved various high blood pressure symptoms such as dizziness, insomnia and headaches. These studies also demonstrated that the strong antibiotic properties chrysanthemums might also be effective for treating angina, or chest pain that stems from coronary heart disease. More human studies need to be completed on chrysanthemum tea, however. According to "Natural Health" magazine, traditional Chinese medicine practitioners have historically used chrysanthemum tea to treat "hot colds," or colds accompanied by fevers, swollen glands and headaches. They add that chrysanthemum helps with fevers because it has a cooling effect. Combine 1 heaping teaspoon each of dried chrysanthemum flowers, dried honeysuckle flowers and dried peppermint. Pour 1 quart of boiling water on the herbs and let the concoction steep until it cools to room temperature. Drink this chrysanthemum tea every two hours to help alleviate your cold symptoms. Chrysanthemum tea can also treat heat rash. "Natural Health" magazine reports that traditional Chinese medicine practitioners believe that heat rash is a symptom of internal temperature imbalances. If you are suffering from heat rash, drinking chrysanthemum tea every two to three hours until heat rash is gone. "Natural Health" magazine also suggests that you avoid consuming sugary or spicy foods that might generate more heat in your body. Chrysanthemum tea might also be effective in treating eye problems, including improving the sight acuity of those who have faltering vision. Herbs 2000 reports that chrysanthemums have a long history of being used to treat blurred vision, spotty vision and watering eyes. Try sipping on chrysanthemum tea if you have sore, dry or red eyes from reading a lot or from working at a computer for long stretches of time. According to Herbs 2000, clinical research has discovered that the active constituents in chrysanthemums have antibiotic effects. These natural antibiotics appear to help fight several types of bacteria, particularly streptococcus and staphylococcus. Chrysanthemum tea can also ease tension headache pain, remedy bad breath and soothe dry mouths or throats. Chrysanthemum tea can help you relax by calming your nerves and clearing your mind. Good for Brain health, Removes bad breath, Senescence inhibition, Rhinitis, Calms Upset stomach, Immune Enhancement.